The WKI3300 is a powerful unit and will easily address the needs of most households. The only unit on the market with a Lifetime Warranty on the motor and against corrosion. If you are a single household who does little cooking or if space under the sink is very tight then choose the slimmer WKI-2600 model. Being continuous feed makes these ideal for situations where space is limited or at a premium such as in flats or cities since they are more compact than an equivalent batch feed unit. Open spec sheet: WKI-3300 Specifications. Waste King – Simply The Best! 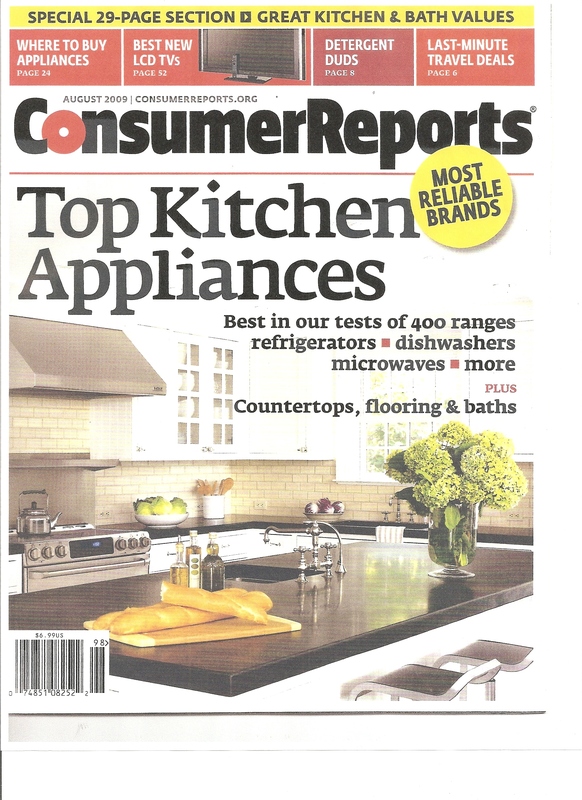 Rated the number 1 waste disposer brand by US Consumer Reports magazine the US equivalent of Which? It also has over 700 positive reviews on Amazon averaging 4.6*. 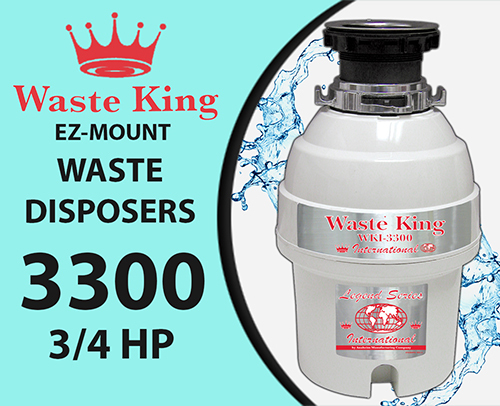 The Waste King International WKI-3300 is the international 240V version of the WK-3300 the USA’s best selling waste disposer. This not only runs on the European voltage of 240V and frequency of 50HZ it is also CE certified for European safety standards. The WKI-3300 is a 3/4 HP 560W powered unit and is ideally sized model to suit 95% of households, those couples who do a lot of entertaining or families of more than 3. Being continuous feed also makes them ideal for where space is limited or at a premium such as in flats or cities since they are far more compact than a batch feed unit. If space under the sink is very tight then the slimmer WKI-2600 unit is recommended. This is the only brand on the market with a Lifetime Warranty from the World’s second biggest waste disposal maker who manufacture over 2 million units a year and who started over 60 years ago. Many waste disposal units struggle or don’t work with all sorts of foods which makes them rather pointless. 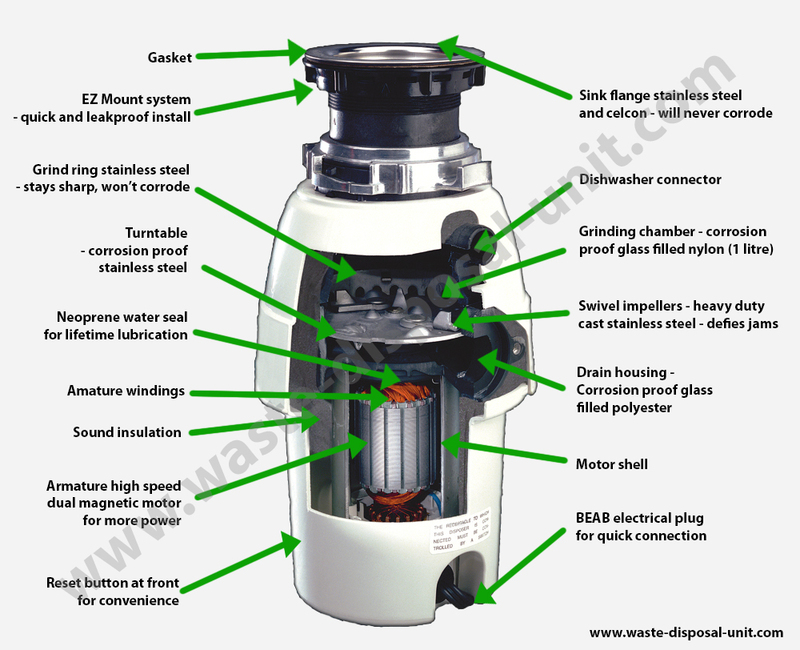 Waste King disposers can handle with ease coffee grains, eggshells, ice cubes, all types of vegetable skins, fruit husks including even the very challenging stringy pineapple skins which NO other brand of unit can cope with. You can also put hot fat so long as it is mixed with a good dose of washing-up liquid to emulsify it along with plenty of cold water to avoid melting any pipes. It can even handle tough cooked poultry bones so clearing up a Sunday roast is an absolute breeze, just rinse everything down the sink with the unit on and into the dishwasher. All the food is rapidly ground up into super-fine particles in one robust grinding chamber and flushed to the sewage treatment works where it is anaerobically digested to make biogas that is then used to generate electricity saving both methane and CO2 greenhouse gasses. It also avoids going to landfill or voluminous and smelly composting. 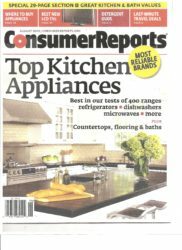 Read the amazing number of 711 reviews on Amazon giving an average rating of 4.6 for the equivalent US 110v unit WK-3300. If you would like to use an air-switch which is an air operated switch with the button mounted on your sink or work surface you can add this. It offers real useability since the switch is very close to the sink with absolute safety, something that cannot be done with a wired switch. When fitting under the sink you can usually add to an existing configuration just with this McAlpine ASC10 adjustable P trap. McAlpine is the best manufacturer of waste pipe fittings in the UK and uses a double barreled connection to avoid leaks and provide great rigidity which is very useful for WDU’s that need to be sturdily mounted. Why settle for less? This is fantastic value, more robust and better performing than the £550 priced ISE Evolution 200. For more info please read the Waste-King page on the menu above or visit our dedicated website for Waste King. – Free UK next day APC delivery, £20 EC delivery, Rest of World please call. Download the Waste King brouchure and WKI 3300 data sheet. NB: Remember to register your extended warranty here. Fitting: We can install the unit within 1 hour drive of our offices in RG10 0LL. this includes an evelope of West London, Oxford, Newbury, Aylesbury and Luton, not inside the congestion zone. It includes a new P-trap if required plus a short length of pipe. Any extra fittings (elbows etc) needed will be charged at cost. A 13 amp fused electrical socket needs to exist under the sink. We can wire it in to a fused spur if needed. If an airswitch is purchased then this can be fitted at the same time for no extra cost. We can put the button in a wooden top or sink blank but NOT a granite surface which requires special drilling. Parking needs to be available or if parking charges apply then these need to be paid by the customer. Please check that the dimensions that you have sufficient room under your sink. We can cut a hole in the side of the cupboard to enable it to fit if needbe. We can do the fitting in the evenings or at weekends. installation will take a maximum of 1 hour. Please contact our office to book a convenient time slot. – WKI3300 with 10 Year Warranty was £283.4 now 20% off £229.60 incl VAT and next day courier delivery. – WKI3300 with Lifetime Warranty was £311.28 now 20% off £249.02 incl VAT and next day courier delivery. – Fixed price installation £150 incl VAT. To order: Online from here The Henley Fan Company or call 01256 636 509 – Exclusive distributors of Waste King in the UK. Having a house built in Spain which will be ready towards the end of next year. Can you supply a 3300 for that market? Hi Peter – Yes we can supply 240v units to anywhere in Europe. The carriage is around £25.